While ambitious, one new bill is promising major changes. California is striding closer to a future that includes 100 percent renewable energy, faster than ever before. California Senate President Kevin de León (D) has proposed a bill which would simultaneously limit California’s hydrocarbon consumption and increase its consumption of renewables according to several goals, and the bill has, as of now, officially cleared the committee stage. 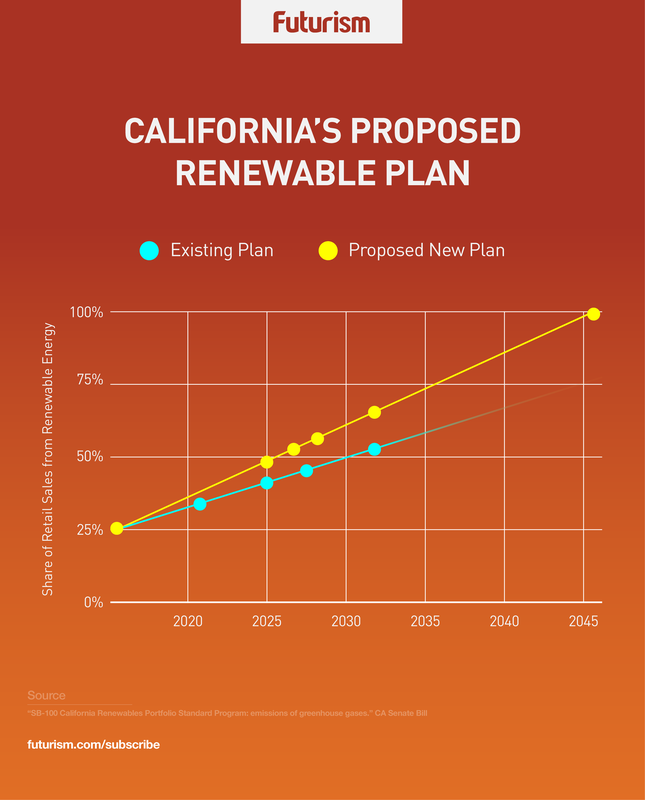 Experts feel it is likely to be signed into law by Governor Brown, and when it is, it will push California to produce 50 percent renewable energy from 2030 to 2026, and set new goals for 60 percent renewable energy by 2030, and 100 percent renewable energy by 2045. This comes at a critical time in the US. President Trump has withdrawn the United States from the Paris Agreement and significantly weakened the EPA and other relevant agencies. Now is a crucial time for states, especially larger states with strong economic chops like California, to show leadership against climate change. Jerry Brown and the California state legislature are making it known that they are committed to doing just that. Should the bill pass, California and Hawaii will be the only two states with legal requirements for 100 percent renewable energy use by 2045, although Massachusetts is considering a goal of 100 percent renewable energy use by 2050. California’s $2.6 trillion GDP is the nation’s largest, comprising about 14 percent of the entire country’s GDP. If California were its own country, its economy would be the world’s sixth largest, bigger than both India and France. A California transitioned entirely to renewables would be inevitably influential. Several procedural hurdles remain before this bill is signed into law, but these are dwarfed by the infrastructural and fiscal challenges that the state will face in making the law work. Currently, California imports more than one-fourth of its electricity from outside the state, and although coal’s share of California’s total megawatt hours of power dropped from 1 percent in 2007 to only 0.2 percent in 2015, some estimate that six percent of its imported electricity comes from coal. In 2010, California imported only 25 percent, so the trend is not dropping as hoped. California is also the third largest state producer of oil and gas, generating about 560,000 barrels of oil every day, as of January 2015, behind only Texas and North Dakota. This means that the state will need to eliminate an entire industry by 2045 and abandon hydrocarbon resources that are both lucrative and accessible. Second, the rest of the nation will miss the production from California at the pumps, paying higher prices for gas and oil across the board. This also means a loss of approximately 456,000 jobs and $38 billion in salaries, about 3.4 percent of California’s GDP. The state will also need to modify or replace more than 50 percent of its infrastructure to support the use of renewables. Still, if any state can succeed in this it’s probably California, which has an existing installed solar capacity of 18,296 megawatts as of 2016— that’s sufficient to bring power to more than 4 million homes. California’s clean energy sector keeps smashing records, as clean energy jobs in California alone outnumber coal jobs nationwide by an order of magnitude. In March, solar supplied more than half of the state’s power for a few hours. Even California utility companies are seeing the light with renewables, for the most part. San Diego Gas and Energy (SDG&E) communications manager Joe Britton told KPBS that 43 percent of the power provided by the utility in 2016 came from sources that do not advance climate change—one of the highest percentages nationwide. 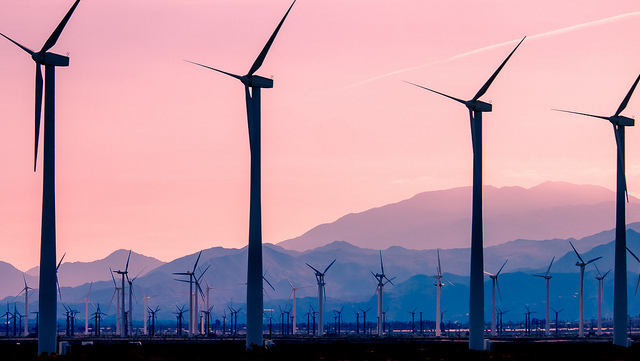 Furthermore, investor-owned utilities in the state are already meeting 27.6 percent of their load with renewable energy sources, and eight California cities have joined a total of 37 cities in the US that have pledged to transition to 100% renewables. Perhaps most striking is that Californians want this bill. They have come out en masse to support it, and with this kind of public support and commercial potential, the bill has a great chance of success.